Union County, NJ – The Union County Teen Arts Festival is looking for volunteers who enjoy working with middle and high school students in and an exciting and dynamic setting. 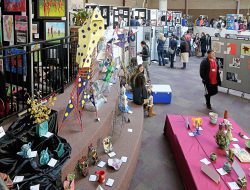 The Union County Teen Arts Festival is scheduled for Thursday and Friday, March 14 and March 15. The festival is sponsored by the Union County Board of Chosen Freeholders through the Office of Cultural and Heritage Affairs in the Department of Parks and Recreation. 0 participants, the event offers performances, critiquing seminars, master classes and workshops with a staff of 55 professional artists in every discipline – visual art, music, creative writing, theater and dance, the festival is a great experience for participants as well as volunteers. Volunteers are needed to assist artists with workshops, manage performance sites and staff information stations. Volunteers must be over 18 and not currently enrolled in high school. The two-day festival is held annually at Union County College in Cranford. The event is open to all students from public, charter, private and parochial middle and high schools in Union County. For more information about the Union County Teen Arts Festival or to sign up as a volunteer, contact the Union County Office of Cultural and Heritage Affairs at 633 Pearl Street, Elizabeth, New Jersey 07202. Telephone: 908-558-2550; NJ Relay Users call 711. Or e-mail us at: culturalinfo@ucnj.org.